Juan Jesus is a proud native of Tenerife and the fourth generation of growers. During the 25 years that he’s overseen Bodegas Viñátigo, he has considerably increased its holdings, planting varieties that he and his team recuperated. 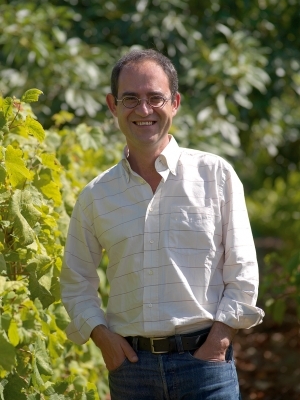 During these years he has also juggled the classes he teaches as a professor of viticulture and enology at the Ciclo Superior de Vitivinicultura. His wife Elena Batist works alongside him and is responsible for the production: for tracking what’s happening in the vineyards — which they do plot by plot and patch by patch — to ensure that harvest takes place at the right time in terms of maturity. They do this work collaboratively, constantly exchanging ideas and viewpoints. Her Master’s degree is in viticulture and oenology from the Universidad Politécnica de Madrid. Viticulture at Viñátigo is sustainability-focused. The grapes are hand-harvested and fermented using indigenous yeasts. Grapes go through two triages, first in the fields and then again in the winery. Minimal sulfur is used in the winery and no synthetic materials are used in the winemaking. Juan Jesus renovated the winery using architecture that evokes the volcanic terroir of Tenerife.